Col. R. S. McLaughlin and "Billy" Durant signed a 15-year contract in 1907, under which the McLaughlin Motor Car Company began to manufacture automobiles under the McLaughlin name, using Buick engines and other mechanical parts. Buick was merged into General Motors shortly after, and in 1915 the firm acquired the manufacturing rights to the Chevrolet brand. Within three years, the McLaughlin Motor Car Company and the Chevrolet Motor Car Company of Canada merged, creating General Motors of Canada in 1918 with McLaughlin as President. The factory expanded rapidly, eventually covering several blocks. The popularity of the automobile in the 1920s generated rapid expansion of Oshawa, which grew in population from 4,000 to 16,000 during this decade, and of its land area. In 1924, Oshawa annexed the area to its south, including the harbour and the community of Cedardale. This growth allowed Oshawa to seek incorporation as a city, which took place 8 March 1924. Oshawa is headquarters to General Motors Canada, which has large-scale manufacturing and administrative operations in the city and employs many thousands both directly and indirectly. Since Windsor, Ontario houses Chrysler Canada headquarters, the two cities have something of a friendly rivalry for the title of "Automotive Capital of Canada", which is now held by Oshawa. While the company’s once essential role in the local economy has diminished, it remains the largest local employer. The city has been attracting film and television producers who have made parts of a number of movies and TV series in Oshawa, most recently It (2017 film)  (based on the Stephen King book, but also X-Men, Chicago, Queer as Folk, Billy Madison and Hannibal. The most popular location in the city for film makers is Parkwood Estate. The council of the City of Oshawa is made up of eleven members - one mayor, seven regional councillors and three city councillors. The mayor is elected at large by electors throughout the city, heads the council of the City of Oshawa and is also a representative of the city on the council of the Regional Municipality of Durham. Seven regional councillors are elected at large by electors throughout the city to represent the city on both the council of the City of Oshawa and the council of the Regional Municipality of Durham. Three city councillors are elected at large by electors throughout the city to represent the city on the council of the City of Oshawa. Oshawa has a CTV affiliate station, CHEX-TV-2 (Channel 12), which is a sister station of Peterborough's CHEX-DT. It airs a daily supper hour news and current affairs program targeted to Durham Region viewers. Although a larger city than Peterborough then and now, Oshawa was not granted a television station in the original 1950s assignments as it was geographically too close to Toronto, since the original spacings were set at 145 km (90 mi). Rogers Cable, the local cable television service provider, operates Rogers TV: a community channel with local television programming for cable subscribers. In September 2018, the city is set to host its first National Hockey League preseason game, when the Buffalo Sabres and New York Islanders play an exhibition contest at the Centre. The Port of Oshawa is a major stop for the auto and steel industries as well as winter road salt handling and agricultural fertilizer. A marine rescue unit (COMRA) is also stationed at the port. A regional airport with on-site customs and immigration authorities also services the City (see above). On 21 May 2009, Canadian Transportation Minister John Baird announced that the status of Oshawa's port would be changed from a harbour commission to a full-fledged Port Authority. The creation of a federal port authority has caused some controversy as there are others who wish to see the port transferred to municipal ownership and recreational use. The closest international airport is Toronto Pearson International Airport, located 75 kilometres west by road in Mississauga. ^ Michele Mandel (14 December 2008). "Even in motor city, there's little loyalty". cnews (Canoe Media). Archived from the original on 15 January 2013. https://archive.is/20130115061643/http://cnews.canoe.ca/CNEWS/Canada/2008/12/14/7746481-sun.html. Retrieved 2012-09-20. ^ Don Peat (17 August 2010). "The Shwa Tiger-Cats? Oshawa municipal candidate eyes tackling team if it leaves Hamilton". Toronto Sun (Canoe Sun Media). Archived from the original on 4 January 2015. https://web.archive.org/web/20150104105501/http://www.torontosun.com/news/torontoandgta/2010/08/17/15054711.html. Retrieved 4 January 2015. ^ "Oshawa: Prepare To Be Amazed". Oshawa homepage. Archived from the original on 23 October 2012. http://www.oshawa.ca/. Retrieved 2012-10-06. ^ "Community highlights for Oshawa". 2006 Census of Canada. Statistics Canada. Archived from the original on 16 December 2008. http://www12.statcan.ca/english/census06/data/profiles/community/Details/Page.cfm?Lang=E&Geo1=CSD&Code1=3518013&Geo2=PR&Code2=35&Data=Count&SearchText=oshawa&SearchType=Begins&SearchPR=35&B1=All. Retrieved 2008-11-01. ^ "2006 Census of Population". 15 October 2008. Archived from the original on 21 February 2008. http://www12.statcan.ca/english/census06/data/popdwell/Table.cfm?T=201&S=3&O=D&RPP=150. ^ Beaumont. "Free English Ojibwe dictionary and translator - Android or PC". Archived from the original on 19 September 2012. http://www.freelang.net/dictionary/ojibwe.html. ^ Orr, Barbara Ramsay (2011). Day trips from Toronto: Getaway ideas for the local traveler. Kearney, NE: Morris Book Publishing LLC. pp. 82, 83. ISBN 978-0-7627-6462-4. https://books.google.com/?id=dZBMK_4EW5IC&pg=PA82&dq=%22Parkwood+National+Historic+Site%22#v=onepage&q=%22Parkwood%20National%20Historic%20Site%22&f=false. ^ a b Macaluso, Grace (7 February 2012). "Oshawa automotive capital of Canada". Windsor Star online. Archived from the original on 11 March 2012. http://blogs.windsorstar.com/2012/02/07/oshawa-automotive-capital-of-canada/. Retrieved 2012-03-22. ^ "Oshawa Clinics". Archived from the original on 25 October 2015. http://www.oshawaclinic.com/. ^ City of Oshawa. "Key labour sectors in Oshawa". Archived from the original on 22 October 2015. https://www.oshawa.ca/business-and-investment/key-sectors.asp. ^ "Archived copy". Archived from the original on 8 May 2017. http://globalnews.ca/news/3176067/best-canadian-cities-full-time-jobs/. Retrieved 2017-04-28. 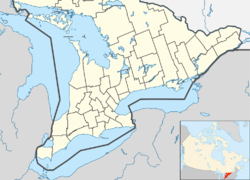 ^ Province of Ontario. "Urban Growth Centres". 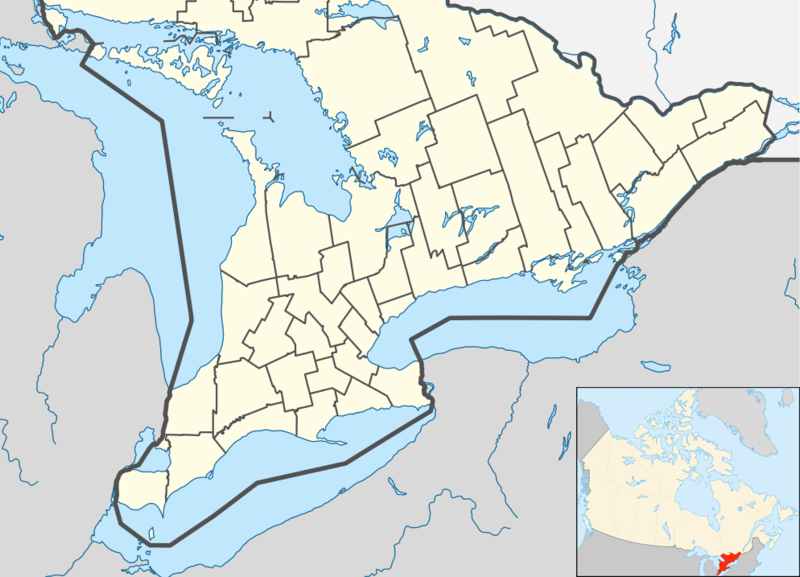 Province of Ontario. Archived from the original on 17 November 2015. https://www.placestogrow.ca/index.php?option=com_content&task=view&id=372&Itemid=15. ^ "Emerging Foodies Guide". City of Oshawa. Archived from the original on 17 November 2015. http://www.oshawa.ca/business-and-investment/resources/emerging-foodiest-new-dining-guide.pdf. ^ "Ontario’s Innovation System". Archived from the original on 11 September 2015. http://www.nao-ontario.ca/ontarios-innovation-system/. ^ Smith, Wm. H. (1846). SMITH'S CANADIAN GAZETTEER - STATISTICAL AND GENERAL INFORMATION RESPECTING ALL PARTS OF THE UPPER PROVINCE, OR CANADA WEST:. Toronto: H. & W. ROWSELL. p. 136. https://archive.org/details/smithscanadianga00smit. ^ "Eye Candy: 1918 McLaughlin Buick" Script error. Toronto Star, November 19, 2016, Donald Cruickshank, page W2. ^ Joe Martin (19 September 2009). Relentless Change: A Casebook for the Study of Canadian Business History. University of Toronto Press. pp. 101–. ISBN 978-1-4426-9715-7. Archived from the original on 28 March 2018. https://books.google.com/books?id=Lx3rlyXbv1UC&pg=PT101. ^ Abella, Irving (1974). On Strike: Six Key Labour Struggles in Canada 1919-1949. Toronto, Ontario, Canada: James Lorimar and Company. pp. 93–128. ISBN 0-88862-057-8. Archived from the original on 28 March 2018. https://books.google.com/books?id=tGa5ju-XbyEC. ^ "Archived copy". Archived from the original on 17 February 2015. http://uoit.ca/footer/campus_buildings/downtown_oshawa/. Retrieved 2015-02-17. ^ City of Oshawa news release: "Archived copy". Archived from the original on 21 March 2016. http://www.oshawa.ca/Modules/News/index.aspx?feedId=0e765813-d33e-4ba5-b464-3e0fff61eab4&page=5&newsId=87235bfa-d73f-434f-8a22-bdec382b669f. Retrieved 2016-03-16. ^ "BMO Labour Report Card". May 6, 2016. Archived from the original on 1 June 2016. http://www.bmonesbittburns.com/economics/provupdates/20160506/pu160506.pdf. ^ "Archived copy". Archived from the original on 2 September 2017. https://www.oshawa.ca/business-and-investment/filming-office.asp. Retrieved 2017-09-13. ^ "Archived copy". Archived from the original on 10 August 2016. https://www.imdb.com/search/title?locations=Parkwood%20Estate,%20Oshawa,%20Ontario,%20Canada. Retrieved 2017-09-13. ^ "‘It’ movie being filmed in Oshawa". 3 August 2016. http://www.torontosun.com/2016/08/03/it-movie-being-filmed-in-oshawa. ^ "Archived copy". Archived from the original on 14 September 2017. http://www.canadianautomotivemuseum.com/visit-oshawa/. Retrieved 2017-09-13. ^ "Archived copy". Archived from the original on 14 September 2017. https://www.durhamregion.com/whatson-story/5450444-top-nine-grossing-movies-filmed-at-parkwood-estates-in-oshawa/. Retrieved 2017-09-13. ^ "Archived copy". Archived from the original on 14 September 2017. https://moviemaps.org/locations/6q. Retrieved 2017-09-13. ^ "Archived copy". Archived from the original on 8 May 2016. http://ddsb.ca/Schools/Documents/oshawa_school_locations.pdf. Retrieved 2016-07-19. ^ "Advanced Medical Training". Archived from the original on 30 September 2015. https://www.lakeridgehealth.on.ca/en/trainingandresearch/advancedmedicaltraining.asp. ^ "News and Alerts - City of Oshawa". City of Oshawa. Archived from the original on 30 September 2015. http://www.oshawa.ca/Modules/News/index.aspx?keyword=fire%20hall&newsId=dd306a52-b1a9-4284-a60f-1326c2c19c13. ^ "Biography of John S. Larke". Access Genealogy. Archived from the original on 16 July 2011. https://web.archive.org/web/20110716192709/http://www.accessgenealogy.com/scripts/data/database.cgi?file=Data&report=SingleArticle&ArticleID=0031597. ^ "Creating a Forum for the Arts" Script error. Reflections, Durham College Alumni Magazine, Fall 2008, Volume 65. page 4. ^ "Hometown Hockey spirit alive and well in Oshawa". Archived from the original on 30 December 2015. http://www.durhamregion.com/news-story/6210002-hometown-hockey-spirit-alive-and-well-in-oshawa/. ^ "Google Maps". Google Maps. https://www.google.ca/maps/place/Oshawa+Vikings+Rugby+Football+Club/@44.019287,-78.921292,17z/data=!3m1!4b1!4m2!3m1!1s0x89d510acc5555555:0x31ce50237e9452ee. ^ Government of Ontario (June 20, 2016). "Ontario Expanding GO Rail Service in Durham Region". Archived from the original on 20 June 2016. https://news.ontario.ca/opo/en/2016/06/ontario-expanding-go-rail-service-in-durham-region.html. ^ "Community Profiles from the 2006 Census, Statistics Canada - Census Subdivision". 13 March 2007. Archived from the original on 3 March 2016. http://www12.statcan.gc.ca/census-recensement/2006/dp-pd/prof/92-591/details/page.cfm?Lang=E&Geo1=CSD&Code1=3518013&Geo2=PR&Code2=35&Data=Count&SearchText=Oshawa&SearchType=Begins&SearchPR=01&B1=Visible%20minority&Custom=. ^ "Community Profiles from the 2006 Census, Statistics Canada - Census Subdivision". 13 March 2007. Archived from the original on 16 December 2008. http://www12.statcan.ca/english/census06/data/profiles/community/Details/Page.cfm?Lang=E&Geo1=CSD&Code1=3518013&Geo2=PR&Code2=35&Data=Count&SearchText=Oshawa&SearchType=Begins&SearchPR=01&B1=All&Custom=. ^ "Census Profile". 6 May 2015. Archived from the original on 4 March 2016. http://www12.statcan.gc.ca/census-recensement/2011/dp-pd/prof/details/page.cfm?Lang=E&Geo1=CSD&Code1=3518013&Geo2=CD&Code2=3518&Data=Count&SearchText=oshawa&SearchType=Begins&SearchPR=01&B1=All&Custom=&TABID=1. This page uses content from the English language Wikipedia. The original content was at Oshawa. The list of authors can be seen in the page history. As with this Familypedia wiki, the content of Wikipedia is available under the Creative Commons License.